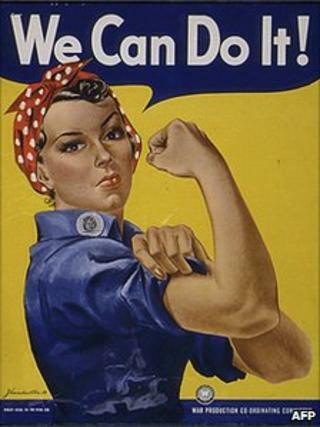 A US female factory worker who inspired the Rosie the Riveter poster during World War II has died at the age of 86. The image of Geraldine Doyle and the "We Can Do It!" message was commissioned to boost morale for women working in manufacturing at the time. Doyle was photographed wearing a red and white polka-dot bandana at a metal factory in Michigan at the age of 17. She died on Sunday in the city of Lansing after suffering complications from arthritis, a spokesperson said. The image featuring Doyle flexing her bicep beneath a rolled-up shirt sleeve helped to prompt women in the US to take positions in manufacturing and replace male workers serving in the military. The image can often be found today on postage stamps, T-shirts, coffee mugs and aprons. Doyle reportedly did not realise she was the inspiration for the Rosie character, which became an icon of the feminist movement in the US, until she spotted the image in a magazine article in 1982. "It was great for her when she finally learned about it," Doyle's daughter, Stephanie Gregg, told the Associated Press news agency. Doyle is said to have left her position at the factory two weeks after the photograph was taken when she learned another worker injured her hand performing the same job.